I meant to post this a LONG time ago, but forgot; it was the first time I ever made breakfast sausage from scratch, and it seemed to me that I nailed it with the first attempt. For all spices, use a generous or scant measurement, according to your tastes. Mix the spices into the sausage thoroughly, adding a little water, beer or other similar liquid (if necessary) in order to reach a desired consistency. Best results seem to be obtained by allowing the sausage to refrigerate overnight, so that the flavours can meld. 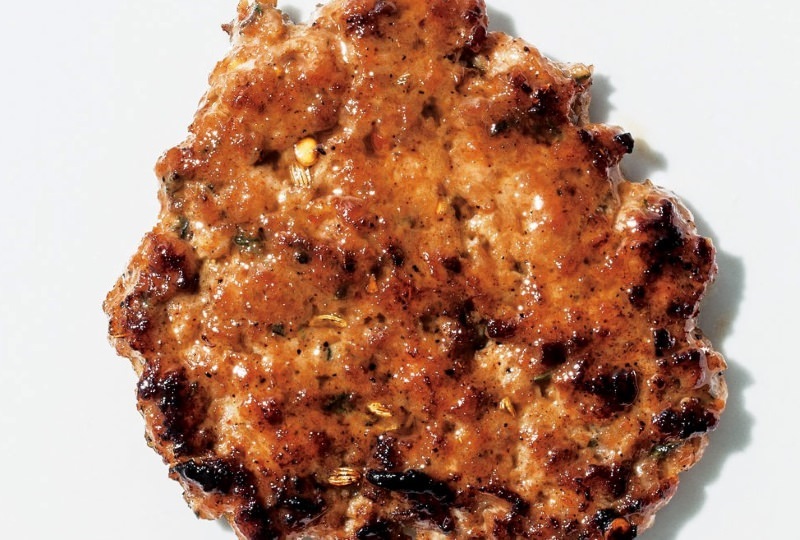 These breakfast sausage patties are perfect for freezing, extra insurance toward future hangovers. Scoop out 1/4-cupfuls of mixture and flatten into about 1/4-inch-thick patties (they will plump slightly when cooked). Do Ahead: Patties can be made 2 days ahead. Stack between parchment paper; cover and chill, or freeze up to 1 month. This raises a question for me: You're using ground pork which I guess is probably 75%-80% lean. If one wishes to grind their own pork--pork shoulder is commonly bargain priced--how do you determent the amount of fat present? Do you have to cut it all up and weigh out the fat and the lean? Or is there some guesstimate by golly gee whiz that can get you close enough? Thanks. For me, a perfect percentage isn't necessary, especially since much of the time I'd most likely (but not always) be mixing with venison. Sausage has always been a convenient way to use trimmings, leftovers and other bits and bobs that result from the slaughter, and in my opinion modern hobbyists run the risk of getting a little too hung up on perfect percentages. I could be wrong in a purist sense, but the ground pork that I have as a by-product of getting a half of pork and the ground pork that would come from grinding a pork shoulder are both equally acceptable, to me. In short, as long as it holds together and doesn't taste like cardboard, I'm good with it. I've been looking for something like this as well, at least a guideline on what you can expect. But there doesn;t seem to be anything like that out there. I'm guessing because each animal is different it's hard to nail down a specific percent fat, but there should at least be a general range. Like say pork shoulder is typically 80 - 90% lean (just guessing there). The best I've seen so far is to just eye-ball it based on how much meat to fat you can see, then add 5% to account for intramuscular fat that you can't see.